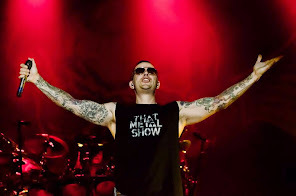 Avenged Sevenfold News: M.Shadows: "I remember on Ozzfest 2006, I was drinking Jäger with..."
M.Shadows: "I remember on Ozzfest 2006, I was drinking Jäger with..."
You’ve participated in some giant summer tours in the past. What are some of the things that you’ve seen go really wrong? Well, with the bands, you’ve gotta figure that you’ve got a bunch of 20-, 30-, 40-year old people that are basically hanging out with each other every day in a parking lot, and all there is back there is booze and other devices of mayhem, I guess you could say. So that gets a bit out of control. I remember on Ozzfest 2006, I was drinking Jäger with Lacuna Coil and Disturbed literally every single day—I must have gained 15 pounds on that tour. [Laughs] You’re like, “Why go work out? Why do anything? Let’s just get done with our set and go get hammered with those guys!” That really takes a toll on your body, and I’m sure a lot of that’s going to be happening on this tour.